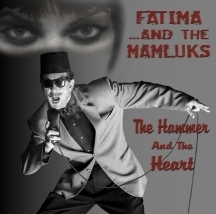 Fatima & The Mamluks' 80s club hit Hassan plus remixes and more! Following a hugely successful decade as leader and singer/songwriter with SAILOR who had a string of hits in 70s and then further recognition as electronic act DATA, GEORG KAJANUS plans in the early 80s for FATIMA & The MAMLUKS were the latest in a successful career as composer, writer and artist. FATIMA & The MAMLUKS was aimed at the dance floors as much as the charts when Georg teamed up in 1983 with his Sailor colleague HENRY MARSH to write and record the tracks. Once completed the tracks were passed to remix duo Art Maharg and Joseph Watt to remix as part of their Razormaid Productions. The track "Hassan" has recently been featured in internet retailer ASOS's advertising campaign. This track was a USA club hit in the 80s.